Abstract: Skating with Airwheel M3 electric drift hover board is a kind of high-tech fashion, which illustrates how high tech improves daily entertainment. One of the highlights of M3 is the variable speed functionality that makes M3 unique and totally different from traditional skateboarding. Skating is now becoming a popular outdoor activity and Airwheel M3 electric drift hover board makes the skateboarding a completely new different experience with many upgraded designs, for instance, it realizes variable speed skateboarding with a monitor. Firstly, Airwheel M3 is featured with the general characteristics of Airwheel series: fashion, quality and speed, however, the variable speed is a new feature coming with Airwheel M3 electric skateboard. The variable-speed functionality makes skateboarding more flexible compared with traditional one. The core power of the variable speed actually comes from premium battery performance. Airwheel M3 electric hoverboard is powered by electricity and it would be easier for skateboarders to speed up if they love to enjoy speedy skateboarding. Instead of speeding up by thrusting against the ground harder by legs, M3 skateboarders are able to control the speed easily with the remote control. Its maximum speed reaches 20km/h, making skating more exciting and trilling. So, how does Airwheel M3 realize the remote control? The answer is the double main control chips installed in the internal part of M3 intelligent motorized skateboard which will collect data through device and transmit to the mobile phone wirelessly. Via the App, you could see the current speed, speed range and you also can easily lock M3 Besides, the battery usage, real-time location and the record of your itinerary can be showed when you click the side bar. Also, skateboarding with M3 electric skateboard is relatively carefree. 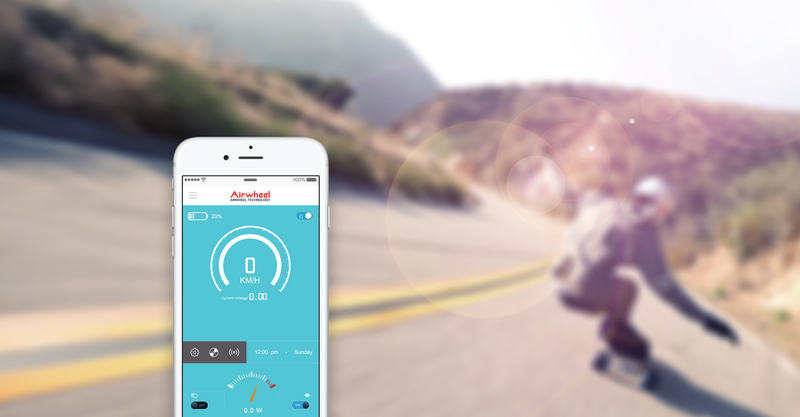 The automatic regulation contributes to the best working condition for Airwheel M3. The specially equipped original steering-sensor system can help skateboarders control the direction and realize the functions of resetting of wheels after each running. Moreover, those creative skateboarders are able to DIY the design of M3, like the sticker, board, battery and even motor, which reflects the special style of each skateboarder. Skateboarders can refresh their skateboarding with the company of Airwheel M3 self-balancing air board.